Executive Summary for Those Who Hate Long Pointless Race Reports: Your sport should be fun, and if it’s not mostly fun then do something else; if you don’t love running fast, run slow; if you don’t love running slow, hike; if you don’t love being on your feet, cycle; if not that, something else. Find that place where you can live with yourself, where you are stretched but fulfilled. Life is short – keep on growing, keep on LIVING, and keep on LOVING. 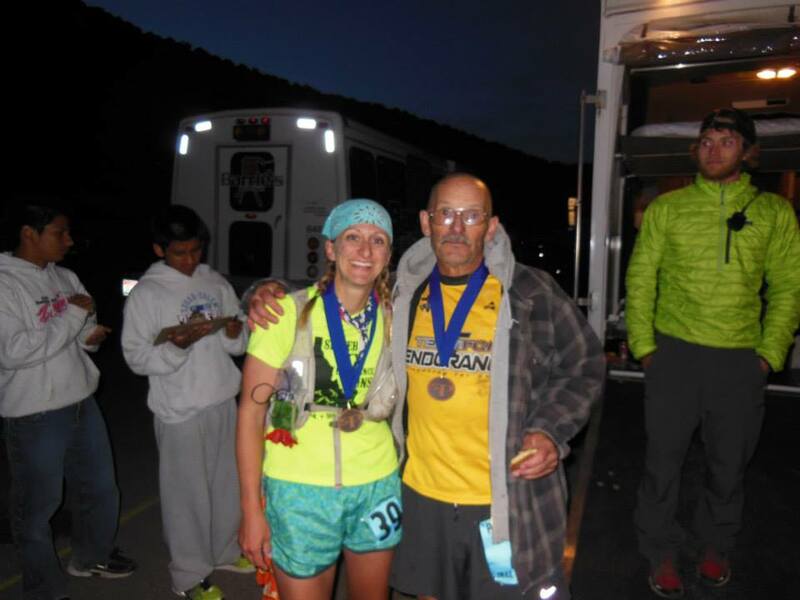 Oh, and the Pocatello 50 is a monster of a race. The Long Pointless Part: I have a little history with the Pocatello 50 and know it’s not a race to be taken lightly. 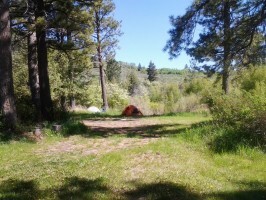 My first foray at Pocatello was Memorial Day weekend 2010. Anyone who lives in Idaho knows that surly weather is pretty much ubiquitous to Memorial Day, and we weren’t disappointed that year. I made it to the first major checkpoint at City Creek at mile 17 in 4:54 to find out that that race was cancelled, plug pulled, while search efforts were commencing for many not so fortunate who were wandering in the blizzard, underclothed and off-course. Based on the 4:54 split and knowing what a beast of a mountain was to come in the second third of the course, I do not believe I would have made the subsequent cutoffs that year. That was my first 50 mile race attempt. Though I have finished three 50 milers, a 100k, and six 100 milers since then, the lure of Pocatello, my original beastly challenge, was still with me three years later, despite going back in 2011 and slogging through the 50k (36 miles) on a snow course – full of postholing, snow fields, and big water crossings – in 10:29. Pocatello wouldn’t rest until I finished the 50 Mile (54 mile) race. Fortunately for me, following a typically crappy-weathered Memorial Day, the Weekend After Memorial Day 2013 dawned sunny and mild with virtually no snow on the course. I figured the only way I would make the cutoffs was with stellar trail conditions, and here I had the perfect setup. People always tell me that I ‘look faster’ or that they think I ‘could be a lot faster.’ I’m not sure how to feel about this. Am I just a slacker? (I don’t feel like it) Underachieving my potential? (probably) It’s a concept I struggle with. To be faster, you have to train faster. The thing is, I have fun training like a slow person. And I got a lotta’ other stuff going on – I know, I know, so does everyone else, but everyone has different limits, you know? So anyway, following my 100 miler at Antelope Island in March and directing the Pickled Feet 24/12/6 Hour & 100 Mile Runs the week after that and an ankle roll the week after THAT, my training for Pocatello consisted of absolutely the best I could muster – a two-week buildup for the ankle, three weeks of ‘peaking’ at 55 miles, and two weeks of semi-taper to the race. For an early season mountain race following a winter of running roads and flat trails down low, that was as good as I could do in the mountain training department. Still, that was the bare minimum I would need to make those pesky cutoffs. Pocatello is no joke. The race gave out Buffs this year. Sam was like, WHAT IN THE WORLD IS A BUFF? Negative feelings swirled pre-race. 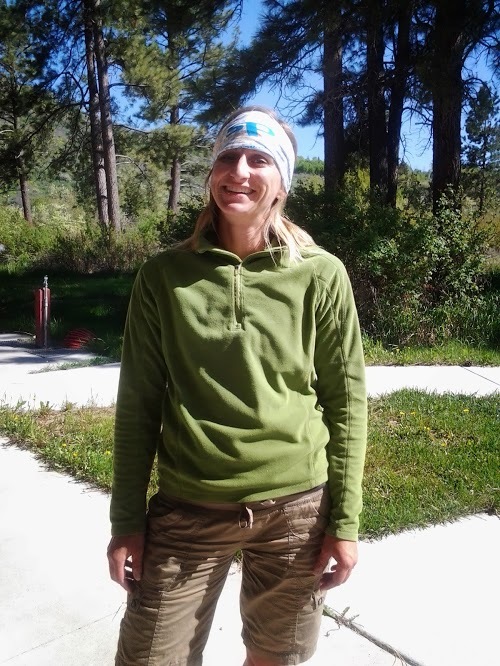 Between the militant ‘green’ aspect involving cupless aid stations, which I hate, and a ‘plateless’ finish line meal – we were instructed to bring our own non-disposable plate or plan on not eating at the finish – and the strict cutoffs (“if you arrive at the 8:30 cutoff at 8:31…your race is OVER; shoulda’ run faster”), I was just feeling like this race had become too elite for me. By the end of the race, I had put that all aside, and that’s all I’m going to say about it because I don’t want this report to be about negative stuff. Ultimately, the P50 is a beautiful challenging course with second-to-none aid stations, supported by really good families who come back year after year. 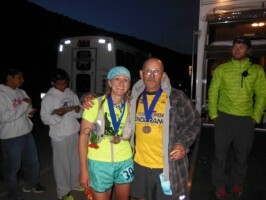 I mean, where else can you say that Karl Meltzer personally put your headlamp ON your head for you at mile 48?? That put the wind in my sails for the last miles…so much so that I didn’t even NEED the stinkin’ headlamp. Photo Credit: Gate City Sports; Me mustering a run out of Gibson Jack, 8.5 miles in. Excepting the 10 mile death march from Mink Creek to the top of Scout Mountain; and the fact that I dropped my Ensure bottle right at the start which cracked it and left me with drippy Ensure and subsequently drippy soda through the rest of the race (that bottle served as my ‘cup’ in place of the spineless UltraSpire joke of a re-usable cup), I worked through the race as I have become accustomed to doing: one step at a time, aid station to aid station, carefully working out my time and making those cutoffs like the back-of-pack pro I’ve become. I had spent a little time in the first third of the race with a new friend named Hugh. I left him on the descent into City Creek and shared a lovely bit of trail with Gary Holloway into the aid station. Gary left me at the aid station when I felt compelled to take a portapotty stop and fix my sock which had slipped down the back of my heel right from the start. I bandaided it up and safety pinned my sock up to the back of my shoe to keep it from slipping again. These two things saved me issues later on, even though my refusal to fix it for 17 miles had already cost me a large chunk of skin off my Achilles. The top of the climb out of City Creek over to Midnight Creek is wicked, and I would like to point out that a Nutella pancake and two Ensure bottles of Coke at City Creek fueled me right up that thing where I passed no fewer than SIX MEN (including Gary, while keeping Hugh behind me), leaving me feeling really positive heading down to Midnight Creek and then Mink Creek. 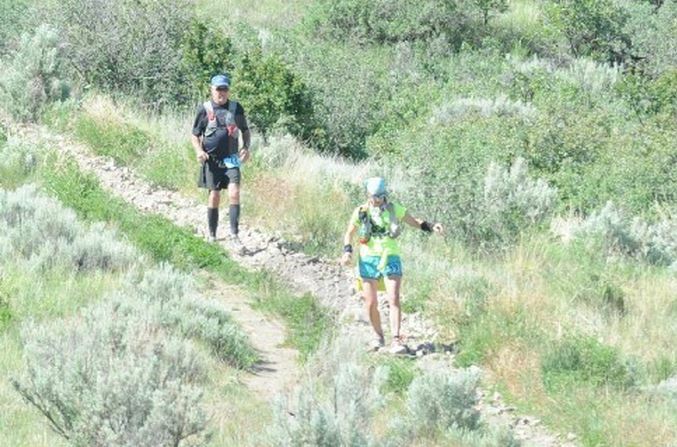 Photo Credit: Gate City Sports; Gary Holloway and I picking our way down a really rocky section into City Creek, Mile 17. The positivity waned a bit as I tried to muster a respectable min/mile pace on the really runnable section down into Mink Creek. I was finding that I would rather just meander and look around enjoying the scenery. 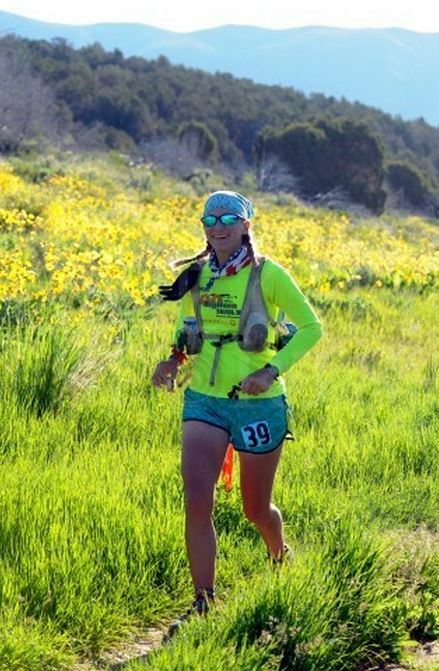 I was truly enjoying being ‘out there’ and was slightly annoyed that I had to ruin the peace by keeping up the pace I knew I needed to keep in order to make that 3:30 pm cutoff at Mink, Mile 32. But I was going to miss that cutoff over my dead body, so I carried on and arrived at Mink Creek a half hour ahead of the cutoff in 9 hours. Good enough. I didn’t have the most collected aid station stop at Mink Creek, but the one great thing that did happen was a volunteer put ice in my pack for the exposed, hot oven of a section up toward South Scout. You can have cold water for a long time if you blow the water out of your tube back into the bladder instead of drinking the warm water from the tube every time – same way you keep water thawed in really cold weather. In addition, Hugh showed up at Mink Creek just as I was heading out, and I was relieved that he had made it. I knew some of those guys behind me would not make that cutoff; this was Hugh’s first ultra, and he has Wasatch looming this fall, so I was feeling quite adamant in a none-of-my-business sort of way that he needed a finish at Pocatello to position himself positively for that. I took off up Scout Mountain – well, ‘took off’ is an exaggeration – more like, shuffled off in the start of a death march that would ebb and flow until ultimately I would get my life back on the descent from the Scout Mountain summit to Big Fir. When the course sweep caught up to my little group near the summit, I was at my lowest. Nausea ripped through me with every step, mentally I had switched to auto-pilot just to endure the trauma of seemingly never getting to the top, and I knew I needed some sugar. It was time to break out the Sport Beans, which have saved more than one race for me. Two at a time, I got the Beans down, and as we summited and started the gnarly descent, I could feel the life returning. Hugh and the neonatologist Con who we shared some enjoyable miles with had both found their running legs again and had left me in the dust; I could see them far out ahead down the draw. But I knew that Grim Sweeper was not my friend, and I was happy to leave the other Gary (running his first ultra on his 30th birthday) back there with him. 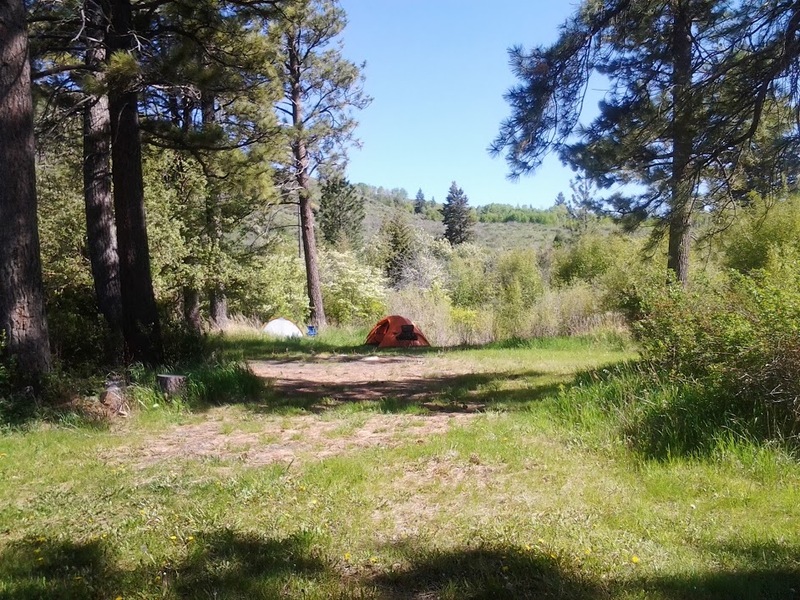 The Pocatello 50 has plentiful camping areas at the start/finish. I roared into Big Fir (can a 13 min/mile be considered roaring?) just a couple minutes behind Hugh. I choked down a pirogue while Karl Meltzer removed my sunglasses and placed my headlamp on my head. 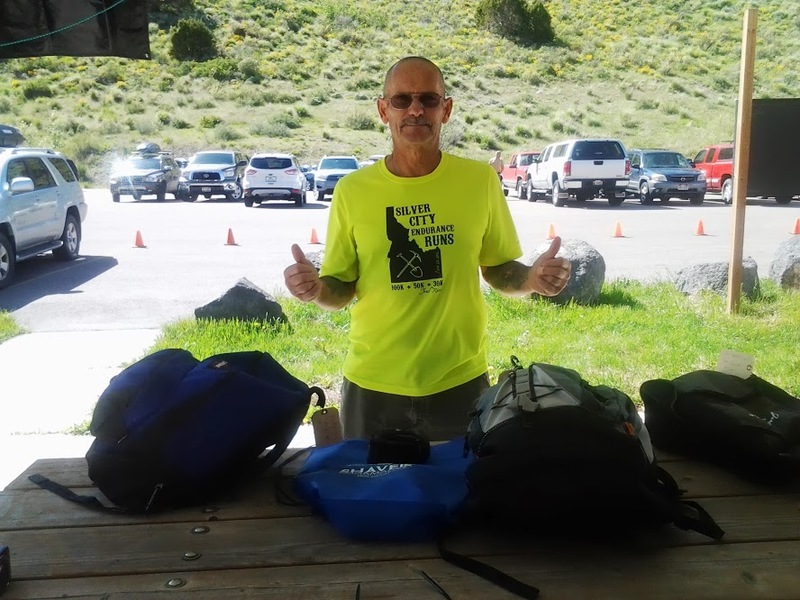 I vowed to not need that headlamp and headed out of the aid station chugging my last drippy Coke from the Ensure bottle, thankfully throwing it away at the trash bag placed a bit down the road. Time to get down to business. For a couple miles past Big Fir, you have the pleasure (not) of running ASPHALT on a slight downhill grade to the Nordic Center; it hurts like hell but it’s a good place to make up time. I ran like a woman on a mission, having seen Hugh on a turn up ahead. The climb over a small hill past the Nordic Center seemed like child’s play following the three beasts we had conquered previously, so I power hiked and caught up with Hugh and his new friend Scott right at the top. Scott wasn’t able to run downhill as much as Hugh and I, so we left him, promising to be at the finish waiting. Hugh was battling nausea like a mad dog by this point, and I could tell it was taking every single bit of strength within him to hold it together and keep on running. I was super impressed at how deep he was digging to finish strong. I was doing a fast-walk/shuffle because it felt only fitting to finish with Hugh after we had done so many miles together, and I wanted to keep the pace to something his stomach would allow. Hugh commented that my walking pace was really good “I’m having to run back here to keep up with your walk!” I took the opportunity to extol the benefits of actually practicing walking and credit Ulli Kamm with being the best teacher and example of an ultrawalker EVER. The finish was a tremendous relief but maybe also a slight letdown that it was over already. The last five miles in from Big Fir were tremendously inspiring – to find out that the last bit of terrain was ‘easier’ than expected, to not be racing any more cutoffs, to know we had conquered this monster of a course. Sam Collier and I at the finish line with RD Luke Nelson to the right. I was full of joy crossing the finish line with Hugh and meeting his wife Teresa. Mike James put the medal around my neck and noted that I wasn’t hysterical (since when have I ever been hysterical at the finish of a race!?! ); training partner and good friend Sam was there with a hug and news that he finished in a big time PR of 14:33 – pretty good for an old buzzard; Margaret informed me that a shower in the timing guy’s RV was waiting for me (it pays to know people! ); Christine and Lori and Chris and I’m sure others were there with so many hugs; and the best of all was that Dwight served me dinner on a plastic plate that I did not have to go rummage in my tent for! I love the long boring version. Makes me want to go back and get MY revenge!